I hear a lot of people speaking about GMO or Non- GMO, I always had a feeling that most of them do not even know what they are talking about. GMO stands for “Genetically Modified Organisms” these organisms could be any plant or animal that its DNA is changed using genetic engineering while GM stands for “genetic Modification”. The World Health Organization (WHO) defines genetically modified organisms (GMOs) as, “organisms (i.e. plants, animals or microorganisms) in which the genetic material (DNA) has been altered in a way that does not occur naturally by mating and/or natural recombination” (1). We have been modifying foods for the longest of time, food items such as breeding cows for meat or milk, making more beautiful and tastier fruits and vegetables. The big question has been if the GM foods are safe or not. Fortunately, most food scientists believe that GM foods are safe to eat and that the overall benefits outweigh the risks. Of course, just like anything new – there is always resistance. Many people are resistant towards GMO/GM foods as they feel they are unsafe and unnatural. Most people are rooting for organic foods and we all know that organic food production is against GMO foods. Fortunately, as I mentioned above scientists view this technology as safe and useful approach. There are potential risks that have been put on the table, Human risk, environmental risk and Socio-ecological risk that have surfaced but unfortunately, there is no enough concrete evidence to support these claims. GMO does seem to threat the business of Small farmers as they do not have sophisticated technology needed for GM food production (1). 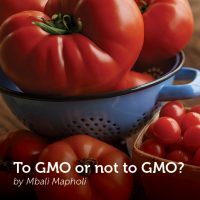 The bottom line is that if the GM food item has passed all the health & safety, nutritional and agricultural check -points it should be safe for human consumption. The trick is to make sure as individuals & countries that our sources of GM foods are legit. There are many foods that never make it to the shelves because they do not meet the standards as required by WHO. There are also products such as the first GM tomato (Flavr Savr”), this tomato was modified to slow softening so that it could stay fresher for longer, but it was only on the market for a brief period due to poor sensory qualities and is currently not grown anywhere in the world (2).